All market economies have periods when — spending on goods and services — rises. Consumers buy more, companies invest more, and production, income, profits and employment increase. These periods are always followed by periods when spending and investment fall, and unemployment rises. This is the . A period during which economic activity increases and the economy is expanding is an or . If it lasts a long time it is called a . 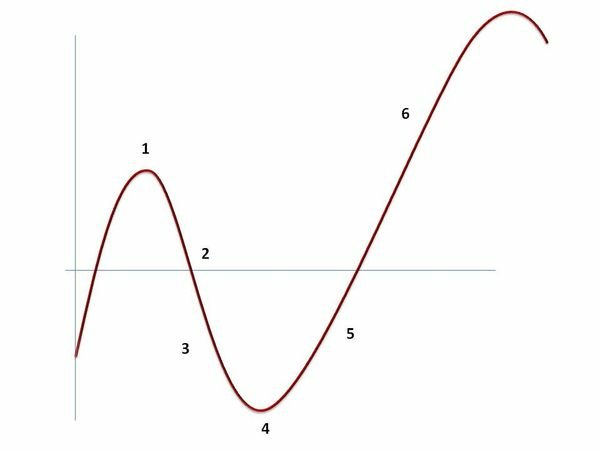 The highest point of the business cycle is a , which if followed by a , during which the amount of economic activity decreases. If the economy keeps contracting for more than six months, the downswing is called a . A serious, long-lasting recession is called a or a . The lowest point of the business cycle is a , which is followed by a recovery, when economic activity increases again, and a new cycle begins. Note: A downturn is also called a downswing or a period of contraction; a recovery is also called an upturn, an upswing or a period of expansion. Governments and central banks use , which involves changing the levels of and to try to limit the extent of the business cycle. If an economy is moving into a recession, the government might have a fiscal policy. This means trying to by increasing government spending, or by cutting levels of direct or indirect tax so that individuals and companies have more money to spend. If an economy is — expanding too quickly — it means that industry is working at and producing as much as it possibly can. Because demand is greater than supply, leading to rising prices and inflation, the government might have a fiscal policy. This means trying to the economy: reducing the amount of economic activity by raising tax rates or cutting government expenditure. This reduces the level of demand in the economy and helps reduce inflation. Governments or central banks can also use — changing interest rates and the level of the money supply — to influence the level of economic activity. They can or increase economic activity if the economy is in a downturn by reducing interest rates and allowing the rate of growth of the money supply to increase. Alternatively, if the economy is growing too fast and causing inflation, they can slow it down by increasing interest rates and reducing the rate of growth of the money supply. The main reason for having an independent central bank is to prevent governments from creating a — a cycle that will be at high point at the time of the next election. Governments can do this by beginning their periods of office with a couple of years of policies designed to stop the economy form growing, followed by tax cuts and monetary expansion in the two years before the next election. This policy, sometimes called , helps the government get re-elected but is not good for economic stability. An independent central bank makes this less likely to happen. Label the graph with words from the box. If the government thinks the economy is contracting too much, . . .
it can cut taxes and increase its spending. it can raise tax rates and cut its expenditure. manipulate the business cycle to their own advantage. interest rates and the money supply. Fiscal policy involves . . . If there isn’t an independent central bank, governments can . . . If the government thinks the economy is growing too quickly, . . .
Monetary policy involves . . . Choose group of verbs with the following meanings. to get bigger or make bigger: . . .
to get smaller or make smaller: . . .